Is a new life possible? Because Shira Greene’s life hasn’t quite turned out as planned. She’s a single mom living with her daughter and her gay friend, Ahmad. Her PhD on Dante’s Vita Nuova hasn’t gotten her a job, and her career as a translator hasn’t exactly taken off either. But then she gets a call from a Nobel Prize-winning Italian poet who insists she’s the only one who can translate his newest book. Stunned, Shira realizes that—just like that— her life can change. She sees a new beginning beckoning: academic glory, demand for her translations, and even love (her good luck has made her feel more open to the entreaties of a neighborhood indie bookstore owner). There’s only one problem: It all hinges on the translation, and as Shira starts working on the exquisitely intricate passages of the poet’s book, she realizes that it may in fact be, well ... impossible to translate. 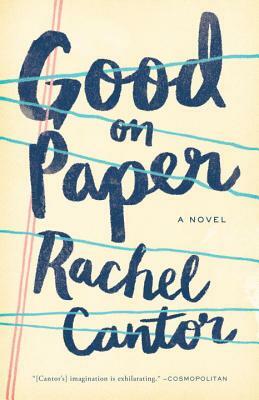 A deft, funny, and big-hearted novel about second chances, Good on Paper is a grand novel of family, friendship, and possibility. RACHEL CANTOR is the author of the acclaimed debut novel A Highly Unlikely Scenario (Melville House) and her short stories have appeared in The Paris Review, One Story, Ninth Letter, and The Kenyon Review, among other publications. Good on Paper is her second novel. Cantor was raised in Rome and Connecticut, and currently lives in Brooklyn, NY. “Brooklyn-based writer Rachel Cantor has created a whole new world in her debut novel — a humorous and playful science fiction story." “A Highly Unlikely Scenario is a joyful book, full of the energy of undiluted invention and the thoughtful imagination of a writer to watch. It’s a wild ride and much more – funny, intelligent and entirely pleasing."